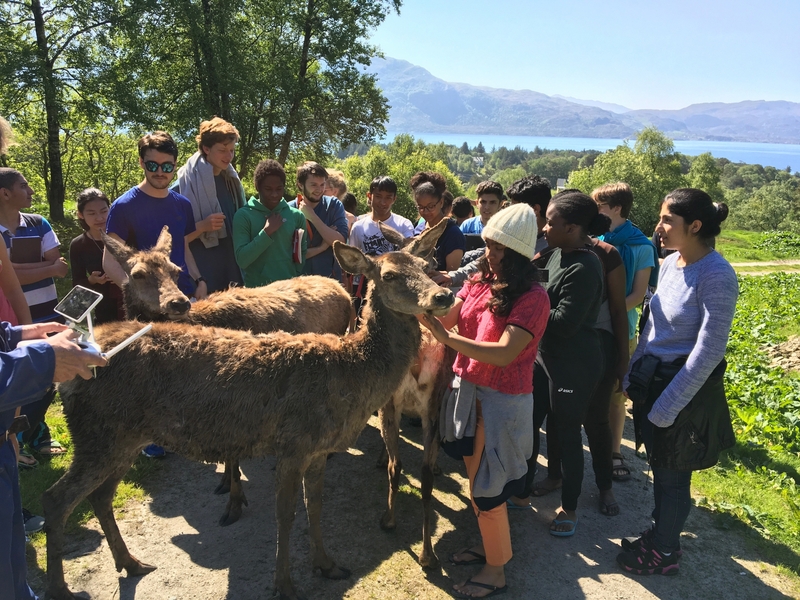 The field trip to island of Svanøy (“Sunnfjords Perle”) – and its “Norwegian Deer Centre” – is a highlight of our annual year’s end. This time in perfect weather. 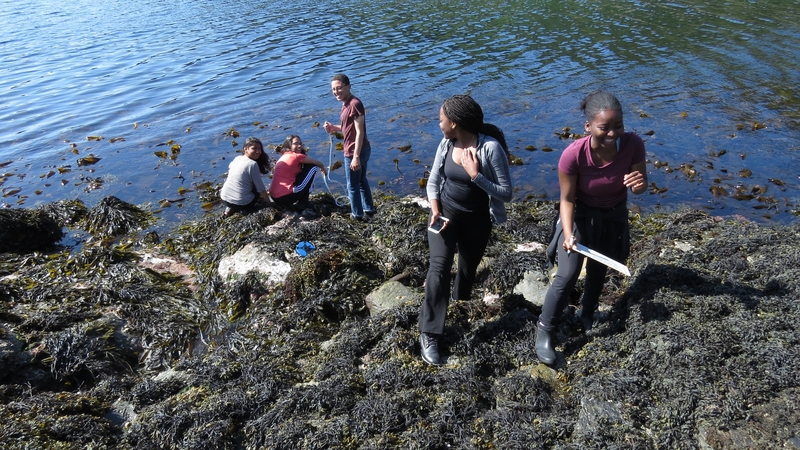 During the boat trip, the Biology students took oceanographic measurements and samples of plankton. On Svanøy, during the lowest tides, they scattered on the beautiful rocky shore studying ecological niches of algae and animal species. Each student engaged in an individual investigation. Some went to the shore during low tide at 4 in the morning to take additional measurements or check their marked snails. Others lingered in the field lab for hours studying the plankton with microscopes (and some played cards, too). The “Dream Team” of five volunteer students and four staff put up and took down tents, warmed up and served all the meals. 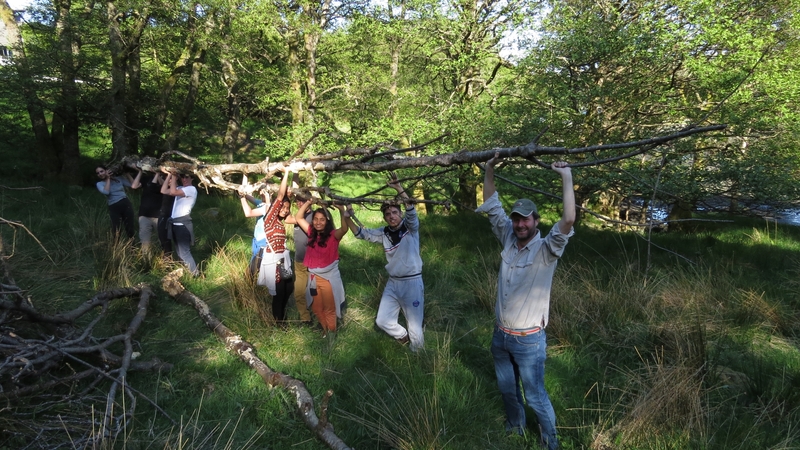 Johan Trygve Solheim, the leader of the Deer Centre gave us two interesting and practical presentations. He shared from his personal experience and insight – and challenged some established views. His first presentation was about the small island community struggling to keep their population and to live sustainably. 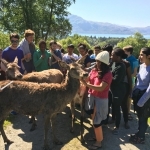 During the Deer workshop next day, Trygve gave essential information on deer farming, with a focus on sustainability and ethical treatment of animals – while those animals freely mingled and allowed caressing by fascinated students. 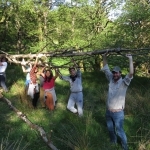 In the evening, everybody contributed two hours of “dugnad” (voluntary communal work) – a kind of exchange for free use of the Centre’s facilities: clearing up some cut wood. 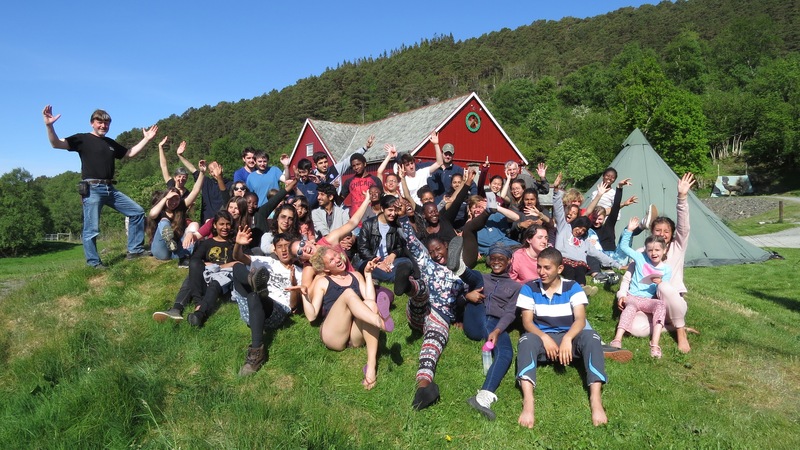 On the last day, one group went hiking over the island’s top, another group walked with Rannveig Solheim across the island to explore the historical buildings, a small group went diving and the rest enjoyed the sun and swimming in the sea. As we watched Trygve, Rannveig, their tractor and emerald bay getting smaller from the departing boat, we were followed by (and cheered to) Trygve’s drone. See the video on the Deer Centre’s facebook page here or here. For an album of photographs, click here. As you may be aware, new legislation came into effect from 25 May 2018 which significantly changes the law applicable to our use of your personal data. This new law – the General Data Protection Regulation (GDPR) – has its origins in the EU and requires us to provide you with additional information on how we process your personal data and also requires us to ensure that we have your consent to send you communications. We take our obligations seriously and strive to ensure that your personal data is securely held at all times. Occasionally we would like to share our news, however, under GDPR we are no longer allowed to send you communications and updates without your permission. If you cannot find the email, please use the Contact Form on this site and put ‘Newsletter’ in the Message box. Inger Johanne Ravn, a family doctor in Fjaler and former UWC Atlantic College student (class of 1991), gave today’s RCN Life Skills session for first years, house mentors, advisors and colleagues in the Care Centre on ‘Health and Wellness at RCN’. Inger Johanne started with a short presentation in the auditorium on diet, sleep patterns, exercise, managing stress – and then ran a hugely stimulating Question and Answer session. Students and staff received many tips / strategies to maintain a healthy lifestyle. After the session, Inger Johanne offered to meet any students interested in studying medicine at university. Mark, our Senior University Counsellor, and 12 students joined Inger Johanne in the sunshine to discuss a career in medicine. Inger Johanne was recently voted the Family Doctor of the Year (2018) by her colleagues in Norway – the first time this has been awarded to a female family doctor. We are hugely fortunate to have her supporting our students and staff – along with the other doctors in our municipality. Graduation took place on Saturday 19th May at UWC Red Cross Nordic. 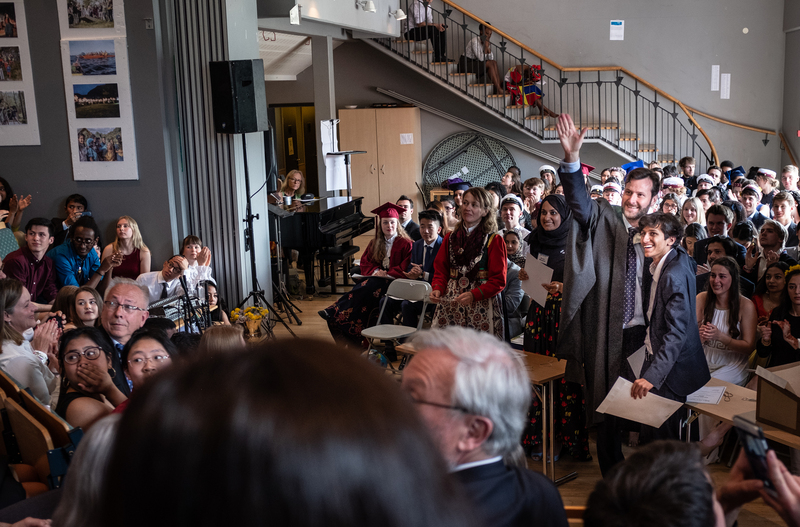 It was a pleasure to welcome so many families, host families from our local community and other guests on Friday evening for dinner in the Høegh and then a cultural show – all coordinated by the first year students. 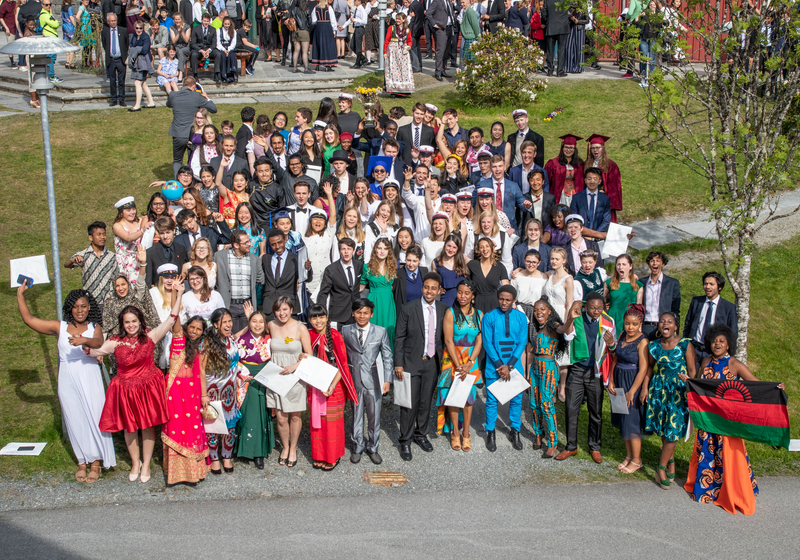 The ceremony took place in a beautifully decorated auditorium at 14:00 on Saturday and consisted of speeches, a slideshow, two special videos for the occasion (see here and below), musical performances and the formal graduation procession. The Rektor, Richard Lamont, opened the ceremony with a welcome address. For a copy of Larry’s welcome address, please click here. 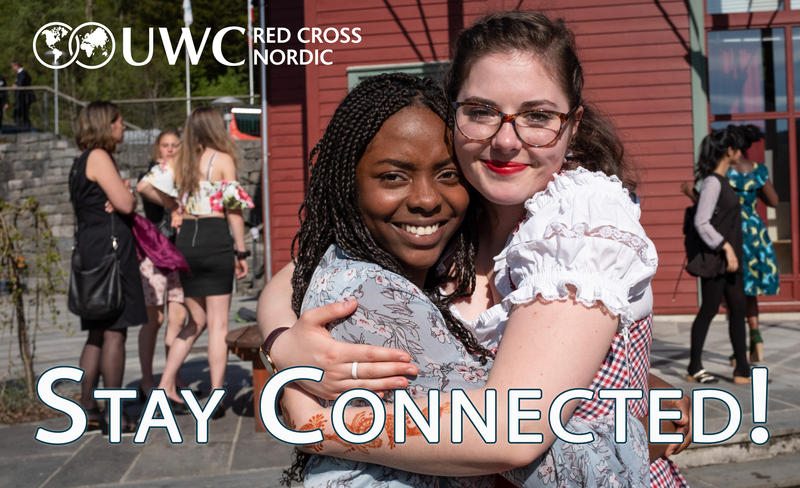 Mawra Mahmood, the Head of Norwegian Red Cross Youth, gave a powerful address about the College’s partnership with the Red Cross and the role our students can play in the future. Her address was followed by speeches from Gunhild Berge Stang (Mayor of Fjaler. Click here for her speech), from second year students (Shweta from India and Raavi from the US / Pakistan) and the farewell message was given by Kristin Vinje (our Chair of the RCN Board). Outside the sun shone and, to mark the occasion and give our second years an extra special send-off, we invited the Dale Musikkorps (Brass Band) to play outside. 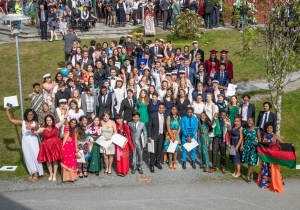 Many of the parents of our second year students were unable to attend the ceremony – and therefore we have posted lots of images and videos on faceboook (the Graduation Dinner and the Ceremony) and a copy of the graduation ceremony programme so that our whole community can connect with the occasion.